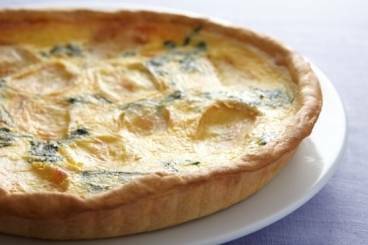 A delicious spinach and reblochon cheese tart, perfect as a starter or a cold lunch. Line your tart case with the pastry roll and trim the edges. Prick the base of the pastry with a fork. Cover the pastry with a sheet of baking parchment and then add baking beans. Transfer to the oven and blind bake for 10 minutes. Remove from the oven, remove the baking beans and allow to cool. Turn the oven up to 200°C for the rest of the recipe. Cut the reblochon into thick slices. In a bowl, beat together the eggs and the egg yolks. Pour the the milk and the cream, whisking all the time. Season with salt, pepper and ground nutmeg. Wash the spinach leaves and place in a colander to thoroughly drain. Crush the garlic with the side of your knife. Heat a frying pan, add the butter and the lightly crushed garlic clove. Allow the butter to brown to a beurre noisette and then add the spinach leaves. Season with salt and pepper and allow to cook for 2 minutes. Drain any liquid from the pan before placing the spinach in the base of the tart case. Pour the egg mixture over the spinach and then lay the reblochon slices on top. Transfer to the oven and bake for 20 to 25 minutes. Remove from the oven and rest before serving.